Montse Cordero learns how to use the Advanced Resistive Exercise Device from crew instructor Robert Tweedy. 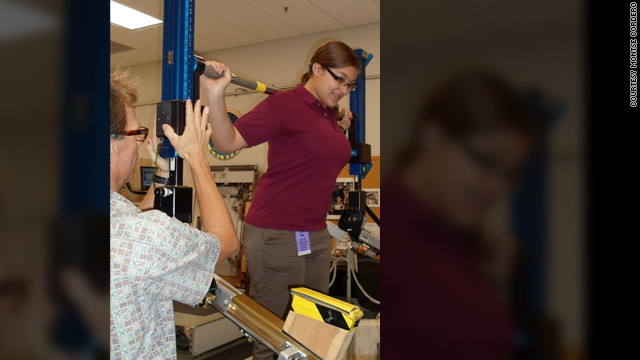 Editor's note: Montse Cordero is a 17-year-old student from Costa Rica participating in the Foundation for International Space Education's United Space School, a two-week summer program in Houston. She'll be blogging about her experiences in the program. Need to catch up? Check out all her previous posts here. Our day started in a way that was a lot of fun: Early in the morning, housemate Alex Carney and I were taken to a building where they have the astronaut exercise machines. We thought we were going to get to see the machines again and maybe climb on them, but it was a lot more amazing than that. They have two treadmills and a “weightlifting” machine. We started with COLBERT (which actually does stand for something - Combined Operational Load Bearing External Resistance Treadmill). We not only got to run on it but to use a harness attached with bungees to it, just like you’d do it on board the International Space Station. It was tiring but a lot of fun. As a little bonus, the harness we got to use is the one that astronaut Nicole Stott (@Astro_Nicole) used on the station. Then we moved on to the Advanced Resistive Exercise Device, or ARED, which is basically a weightlifting machine. We got to do a couple of squats on it. It was not easy, but for a couple of reps it was exciting. That afternoon we traveled to Galveston to visit the University of Texas Medical Branch, where we had lunch and a few presentations about space medicine. We heard about what life in space can look like and about the effects of space travel in psychology. These were quite interesting, and they got us thinking about the biological aspects of our mission in a completely different way. We also got to see a few of the center's labs. They talked to us about experiments such as artificial DNA synthesizing, and we got to see the machines with which they work. It was in the same building where they give all the medical tests to see if you are fit to travel to space - it's the only facility that can do it. Overall, it was an interesting day. To finish it nicely, we had dinner with our host family in Galveston and then we drove back and "geeked out" for a while in a bookstore (a good one, not like the small ones we have back at home). Talk about a starry eyed night. What a beautiful picture. Would be ineteresting to hitch a ride on the Hubble for a couple of months. Would it be possible to point the Hubble in the direction of the WR 104 neutron star? I would love to view the star with future gamma-ray burst that will eventually destroy your solar system. Certainly not in my lifetime... but someday in the future.